I've been interested in trying this for awhile. I'm going to periodically post an unlabelled photograph - the first one to write back with the photographer's name wins. To submit an answer, send an email to fototazo@gmail.com with "Photograph Guess" in the subject line. In part the interest in doing this comes out of a series of interviews with Blake Andrews which left me looking for ways to create interactive posts. It also comes from a post trend on the Flak Photo Network in which someone posts an image and asks for help finding out who created the image - the response is usually swift and the interest in helping high. It - lastly - also comes out of a need as an editor to make a quick post on days I teach or while traveling or while waiting on returns from collaborators on planned posts. I'm currently in a combination of all three. I wish I had a fancy reward offer. What I'll do is post the winner's name and a link to their site here in this post with the correct answer when it's received, along with a little information about the photographer and the image. That was fast! A correct answer is in from Oscar Ciutat, a photographer based in Barcelona. 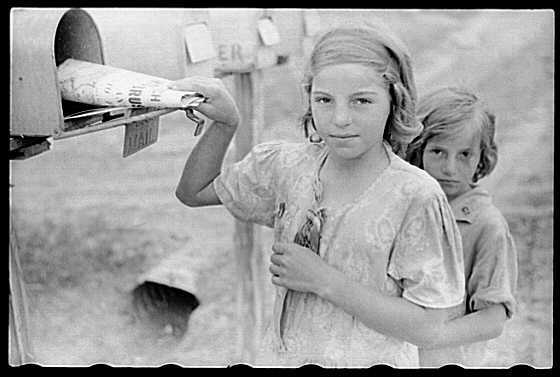 This 1940 image is from FSA photographer John Vachon and titled "Ozark children getting mail from RFD box, Missouri."